This is my place to review, and to blog all the bookish things. I'm trying to think how old I would have been when I read this for the first time. I must have been either 14 or 15. It terrified me, genuinely terrified me, to the point where this is the first time I've re-read it since. And it's just terrified me again. I've read a shed-load of horror in my time, and I'm very fond of some contemporaries who write in a completely different style to King. 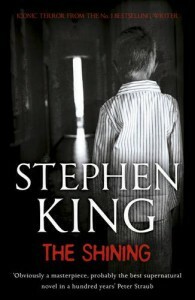 But re-reading The Shining has reminded me why King is, well, King when it comes to horror. It's the slow build, the atmosphere he painstakingly creates which completely draws you in. And once you're in, you can't get out until either your nerve breaks and you pull a Joey and stash the book in the freezer, or you make it through to the end and come out the other side a sweating, panic-stricken wreck. The detail King packs in to this one is incredible, and that slow burn isn't going to be for everyone, especially in a market packed full of instant-start zombie thrillers that kick off in the middle of everything and require little or no background. Horror novels where gore is the hook and suspense barely features. Much as I love a fast, easy, gory read, The Shining has reminded me of the true meaning of horror. Late nights, completely immersed. Turning the bedside light out at 2 in the morning, and then turning it straight back on 'just to check' a strange shadow in the room. Then lying awake, trying to think of something else, anything else. I think using Danny as an example is the best way to explain it, it's that feeling you get when you're scared to walk past a fire extinguisher, no matter how crazy you know it is, no matter how stupid you feel, you just want to run like hell all the same. The gorgeous new Hodder edition of this one proudly proclaims "Iconic Terror" on the spine, and that's exactly what you're getting. If you've never read it, you missed a rare treat. Don't go expecting instant action and full 3D blood and guts, but be prepared to experience a steady crescendo of fear that ends in full blown terror, and stays with you.